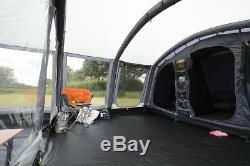 New Kampa Croyde 6 Air Weathershield 150D Inflatable Tent - 2018. 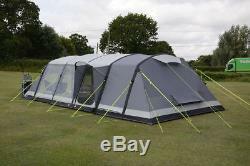 Kampa have further improved the Croyde 6 Air for 2018 it is available in several different specifications. This is the inflatable version that we offer in two superb flysheet materials - a heavy duty Weathershield 150D polyester flysheet or a breathable Airflow polycotton version. 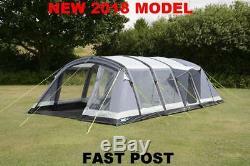 Both offer a superb camping experience with a high level of specification. At the rear youll find the large bedrooms, in a 2+2+2 configuration and in front of these is a large living area with a fully sewn in groundsheet keeping the weather and bugs at bay. 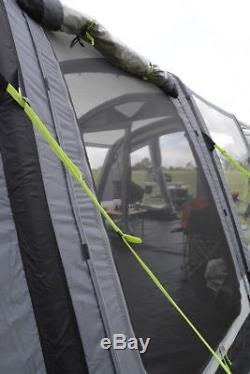 The front of the tent offers a truly flexible space. It can be incorporated into the main living area to give an exceptionally large interior space or it can divided off to create another room. Rolling back the front panel makes a large sun canopy. It is also a great area for kicking off your shoes before entering the main living area. 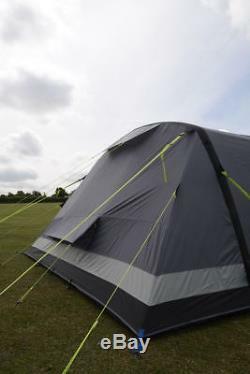 It takes only minutes to pump the tent up and a similar time to fully deflate, effortlessly, before rolling up and packing into the oversized carry bag. The high pressure AirFrame provides a sturdy structure that will cope with the worst of the weather, especially when combined with the storm tie downs that are included for each corner. Weathershield Pro 6000 polyester material. Inflatable - external inflation points. NEW - Sleep-Tite darkened bedrooms. 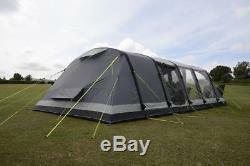 Large inner tents and master centre bedroom. Toggle-in groundsheet for front vestibule area. Side door with canopy and secondary mesh panel. Front, rear and sleeping area weather protected ventilation. Organisers on inner tent front wall and pockets in inner tents. 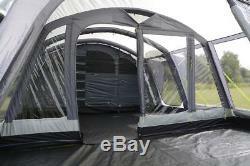 Zipped inner tent dividers for maximum privacy. Colour coded inner tent suspension. NEW - Zipped window blinds. Optional fleece carpets and footprints available. NEW - Kampa Pro Wardrobe Pole Ready - keep you clothes crease-free. 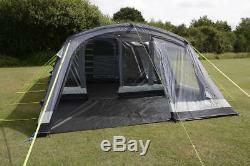 Optional front canopy (Depth: 180cm). NEW - Optional mesh vestibule. 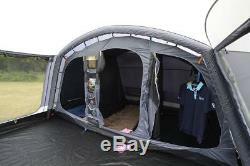 Hydrostatic Head: 6000 mm Flysheet Material: PRO 150D Weathershield® Heavy Duty 6000mm F/R Number of Berths (Tent): 6 Berth (+ optional 2b inner) Living Height (Tent): 210 cm Colour (Tent): Charcoal/Grey Groundsheet Type (Tent): Fully Sewn In (SIG System) Canopy Options (Tent): Extra Large Front Vesibule (Optional). PLEASE NOTE: Our shop is closed every THURSDAY. 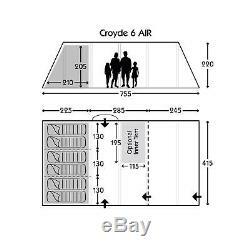 The item "New 2018 Kampa Croyde 6 Man Person Berth Inflatable Large Family Air Tent 2018" is in sale since Friday, April 27, 2018.